Add a dash of spice to your wardrobe wearing the Sportmax Tanga Pop Over Dress. A-line silhouette. Jewel neckline. Sleeveless. Side zip and shoulder snap closure. Side hand pockets. Slight ruffle detail at waist. Straight hemline. 100 percent polyester. Lining: 100 percent polyester. Hand wash cold, line dry in shade. Imported. This item may ship with an attached security tag. Merchandise returned without the original security tag attached or a damaged tag may not qualify for a refund. Measurements: Length: 36 in Product measurements were taken using size 2. Please note that measurements may vary by size. Be a vision wearing the Sportmax Assiro Lace Printed Jersey Dress. A-line silhouette. Round neckline. Sleeveless. Removable waist belt. Lace overly. Straight hemline. Jersey fabric 1: 100 percent nylon. Jersey fabric 2: 52 percent rayon, 27 percent nylon, 20 percent cotton. Lining: 75 percent nylon, 25 percent spandex. Hand wash cold, dry flat in shade. Imported. This item may ship with an attached security tag. Merchandise returned without the original security tag attached or a damaged tag may not qualify for a refund. Measurements: Length: 36 in Product measurements were taken using size SM. Please note that measurements may vary by size. 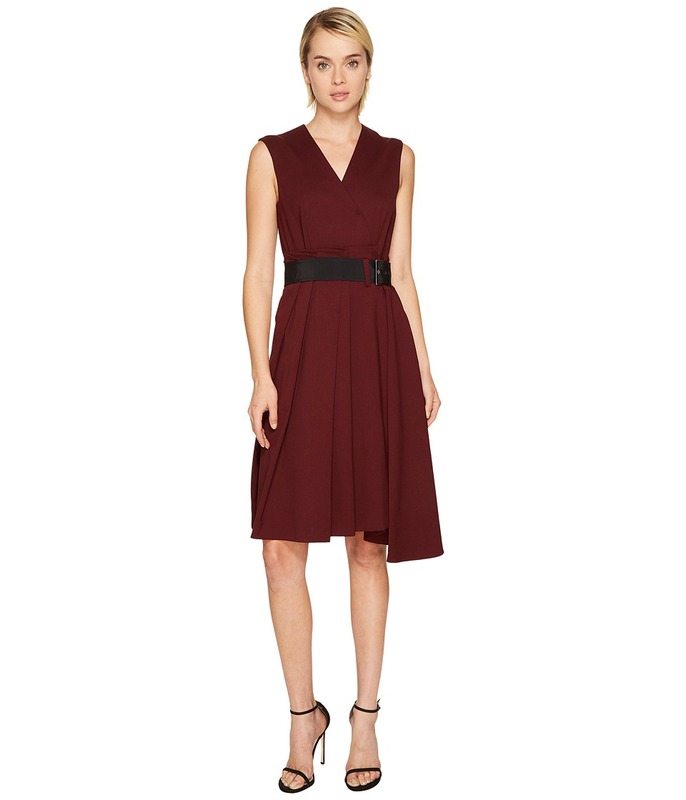 Celebrate your style wearing the Sportmax Maremma Tie Waist Dress. A-line silhouette. V-neck. Sleeveless. Front hidden snap closure. Fitted waist. Belt loops. Removable and adjustable belt. Pleated design at waist. Asymmetrical hemline. 98 percent virgin wool, 2 percent elastane. Lining: 65 percent viscose, 35 percent polyester. Professional dry clean only. Imported. This item may ship with an attached security tag. Merchandise returned without the original security tag attached or a damaged tag may not qualify for a refund. Measurements: Length: 39 in Product measurements were taken using size 2. Please note that measurements may vary by size. Summon your eternal beauty wearing the Sportmax Sonale Floral Jersey Dress. Shift silhouette. Jewel neckline. Sleeveless. Back zip closure. Front tonal flower embroidery. Straight hemline. 100 percent polyamide. Lining: 75 percent acetate, 20 percent polyamide, 5 percent elastane. Print: 100 percent polyester. Hand wash cold, dry flat in shade. Imported. This item may ship with an attached security tag. Merchandise returned without the original security tag attached or a damaged tag may not qualify for a refund. Measurements: Length: 39 in Product measurements were taken using size SM. Please note that measurements may vary by size. Work your endless style from day to night wearing the Sportmax Perry Long Sleeve Top. 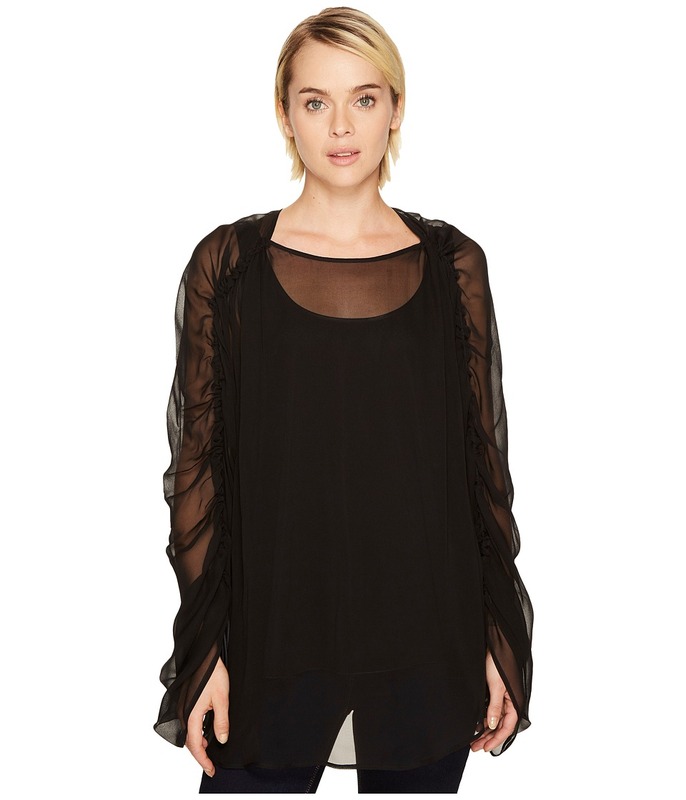 Sheer overlay top with tank undershirt. Jewel neckline. Long sleeves with ruched detail. Back zip placket. Asymmetrical hemline. 75 percent acetate, 20 percent polyamide, 5 percent elastane. Hand wash cold, dry flat in shade. Imported. This item may ship with an attached security tag. Merchandise returned without the original security tag attached or a damaged tag may not qualify for a refund. Measurements: Length: 26 in Product measurements were taken using size MD. Please note that measurements may vary by size. 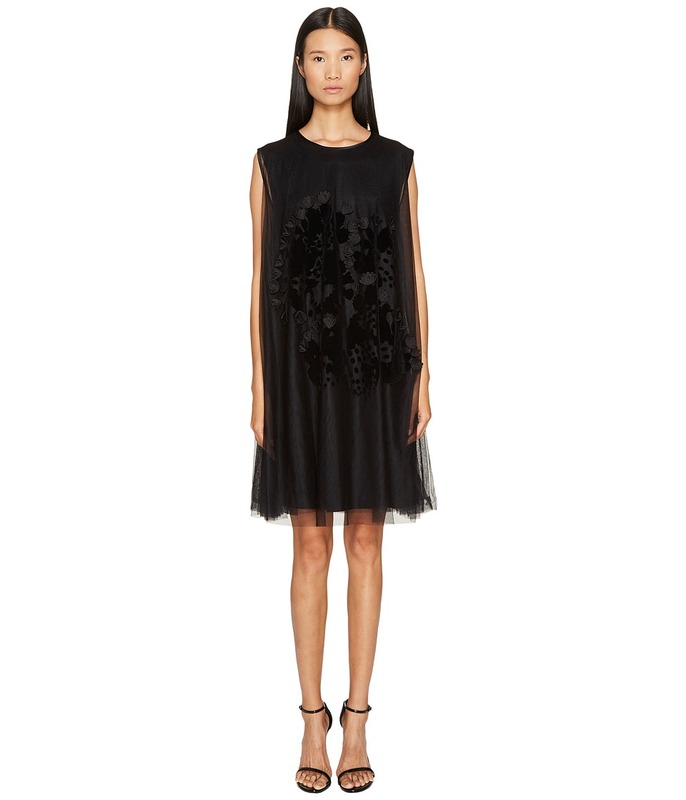 Blaze a trail to fashion success wearing the Sportmax Duda Dress. A-line silhouette. Point collar. Long sleeves with button cuffs. Front button-up closure. Ruffle across chest and sleeves. Fitted waist. Side hand pockets. Straight hemline. 89 percent polyester, 11 percent elastane. Machine wash cold, line dry in shade. Made in Italy. This item may ship with an attached security tag. Merchandise returned without the original security tag attached or a damaged tag may not qualify for a refund. Measurements: Length: 36 in Product measurements were taken using size 10. Please note that measurements may vary by size. Emanate classic beauty wearing the Sportmax Nancy Long Sleeve Lace Dress. Sheath silhouette. Jewel neckline. Long sleeves. Back zip closure. Fitted waist. Allover floral embroidery. Straight hemline. 53 percent viscose, 27 percent polyamide, 20 percent cotton. Woven: 100 percent polyester. Lining: 100 percent polyester. Hand wash cold, dry flat in shade or dry clean. Imported. This item may ship with an attached security tag. Merchandise returned without the original security tag attached or a damaged tag may not qualify for a refund. Measurements: Length: 35 1 2 in Product measurements were taken using size SM. Please note that measurements may vary by size. 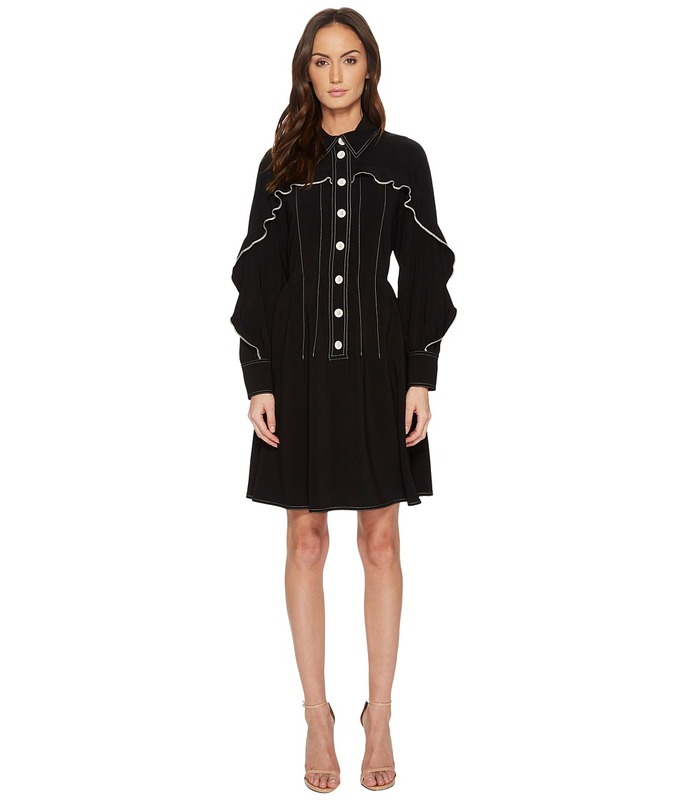 Take casual style to a new level of sophistication wearing the Sportmax Gap Long Sleeve Jersey Nylon Sleeves Dress. Shift silhouette. Jewel neckline. Long sleeves with ruched detail. Back zip placket. Straight hemline. 71 percent viscose, 25 percent polyamide, 4 percent elastane. Sleeve lining: 100 percent polyester. Hand wash cold, dry flat in shade. Imported. This item may ship with an attached security tag. Merchandise returned without the original security tag attached or a damaged tag may not qualify for a refund. Measurements: Length: 33 in Product measurements were taken using size SM. Please note that measurements may vary by size. 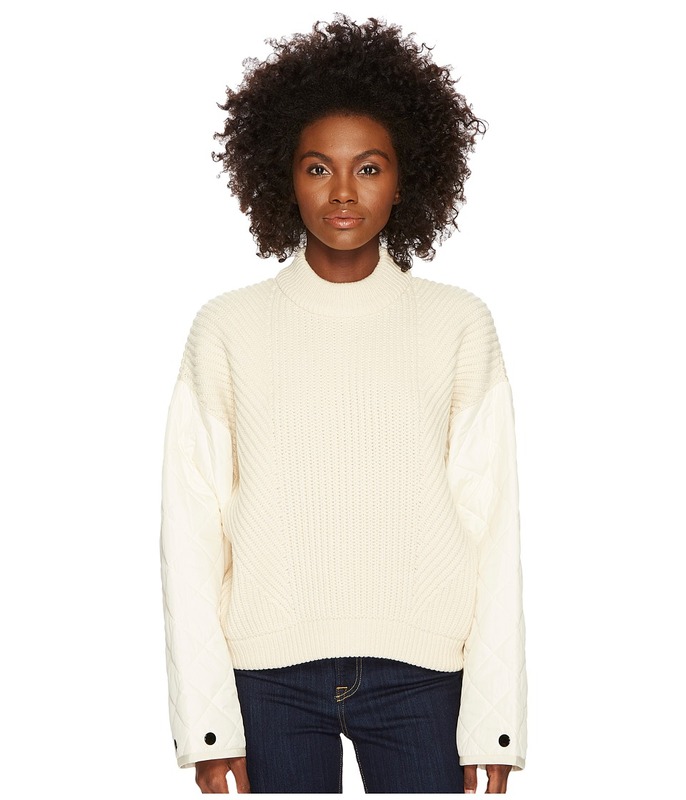 Step off the fashion pages and emerge onto center stage wearing the Sportmax Casa Runway Chunky Sweater. Ribbed mock neck. Quilted long sleeves with button detail at cuff. Pull-on construction. Straight hemline. 68 percent wool, 32 percent polyamide. Knitted: 100 percent polyester. External fabric: 100 percent cotton. Internal fabric: 100 percent polyester. Professional dry clean only. Imported. This item may ship with an attached security tag. Merchandise returned without the original security tag attached or a damaged tag may not qualify for a refund. Measurements: Length: 23 in Product measurements were taken using size MD. Please note that measurements may vary by size.